I knitted this ‘Prowling Cats’ Cowl using the double knitting technique in the round on a circular needle. 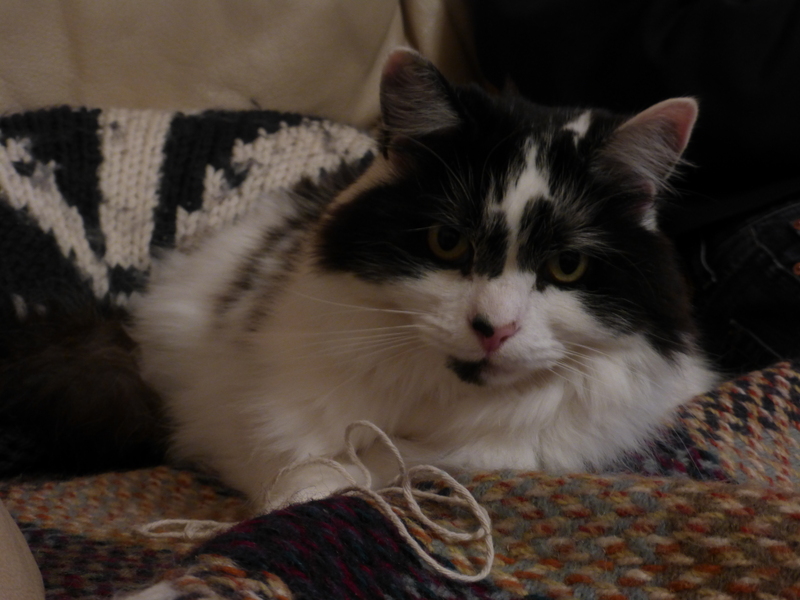 I found following the chart for the cat motifs a lot easier in the round than when using this technique for my ‘Cosy Sheep’ Cowl, which was knitted flat on two needles. When knitting in the round you read every row of the chart from right to left. The first stitch of each pair is knit in the colour shown on the chart whilst the second stitch of the pair is purled in the opposite colour, this applies to every row! So a lot less confusing than knitting flat, when odd rows are worked the same as in the round, but for even rows you read the chart from left to right and have to remember to knit the first stitch of the pair in the opposite colour to that shown and purl the second stitch in the colour shown. 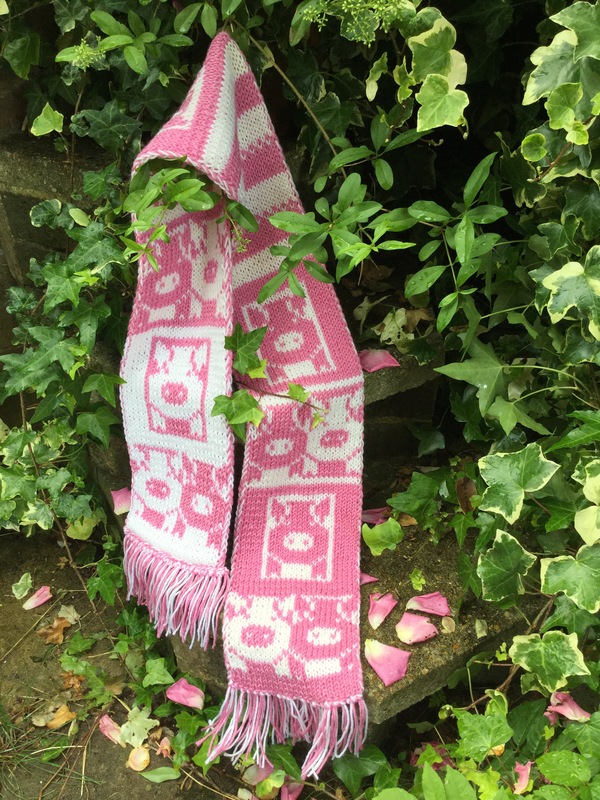 I taught myself the double knitting technique over the summer and, using motifs from a jumper I designed for machine knitters many years ago, I came up with a ‘Pink Pigs Scarf’ and ‘Cosy Sheep Cowl’. The patterns for both are available in my Etsy shop and on Ravelry. The double knitting technique produces a piece of knitting which is double sided and double thickness, a bit like two separate pieces being sewn together back to back, stocking stitch is uppermost on both sides with the colours reversed on the ‘wrong side’ – although you end up with two right sides! The two sides or layers are knit at the same time. If you have not used this technique before all becomes clear as you go. 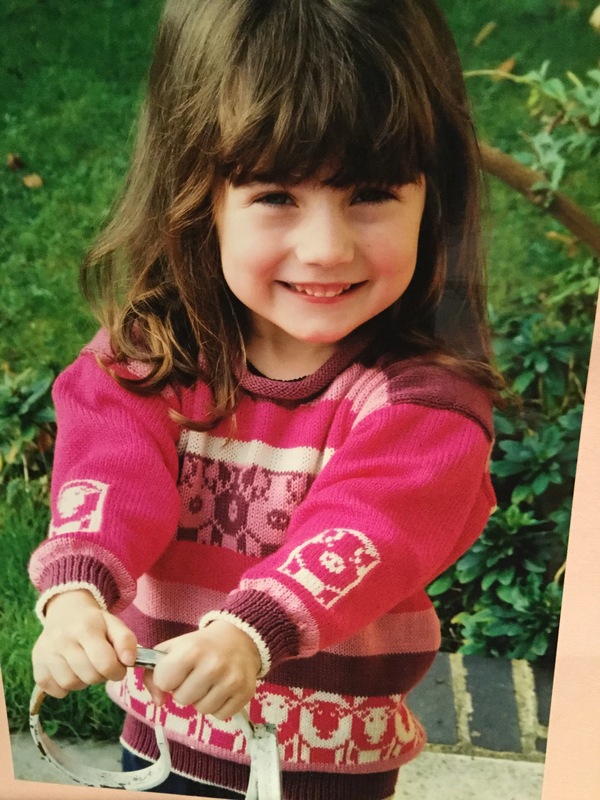 The motifs were originally designed for this jumper back in 2001! It’s a cowl, it’s a scarf, it’s a wrap! However you wear it, this chunky knit will keep you warm and cosy. A quick knit in a chunky/bulky weight yarn using moss/seed stitch and two contrasting colours. Having ripped back and restarted this cowl a couple of times, I am now happy with the result. I found that by using larger needles than recommended by the yarn company, the moss/seed stitch pattern was a looser knit and did not make the fabric too rigid. I used two 100g balls of Rowan purelife British Sheep Breeds Chunky Undyed 100% wool, one in a shade of grey and one cream. Basil is STILL on a diet! 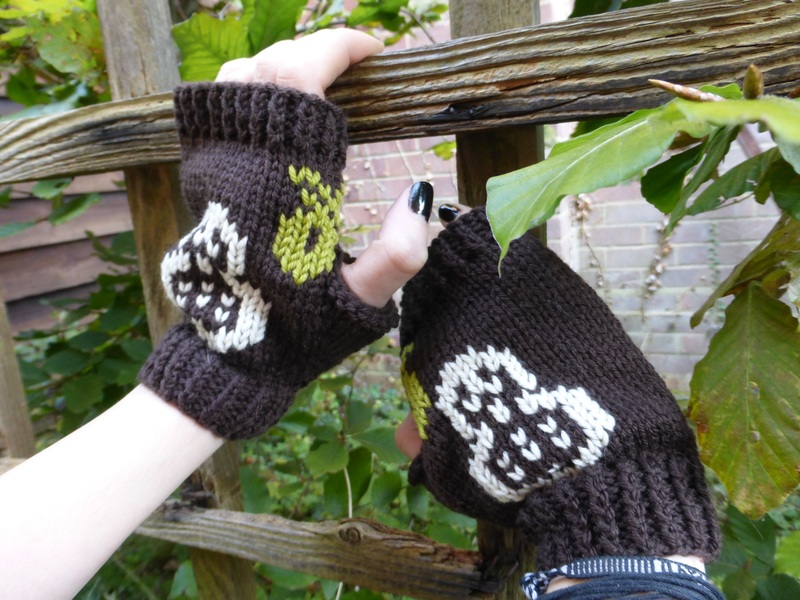 Inspired by the arrival of autumn, my latest project is these cute ‘Woodlanders’ Swiss darned onto fingerless mittens. 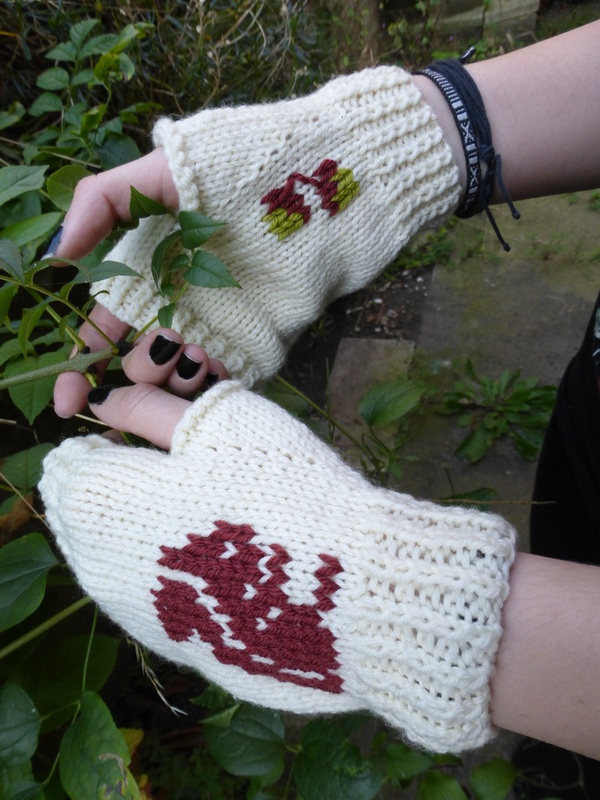 The mittens are knit flat, which makes adding the motifs a lot easier before sewing up the side seam. Check them out in my shops (see sidebar). 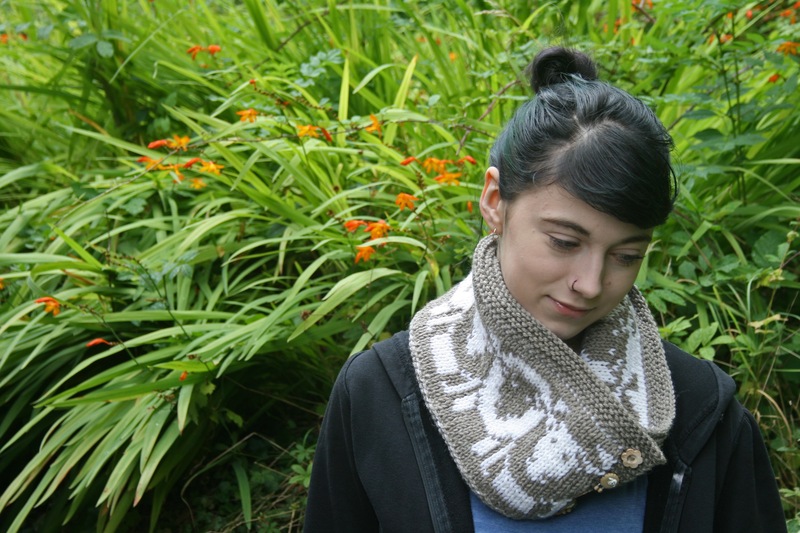 You can purchase your copy of the pattern on any of The Knitters websites…Happy Knitting!